Case Saddlehorn dark red bone folder that is mint in the box and made in 1991. On the back of both blades at the tang is Winston Cup Championship, pattern DR62100-2. The shield is gold in color and not silver. It is 4-5/8" closed. 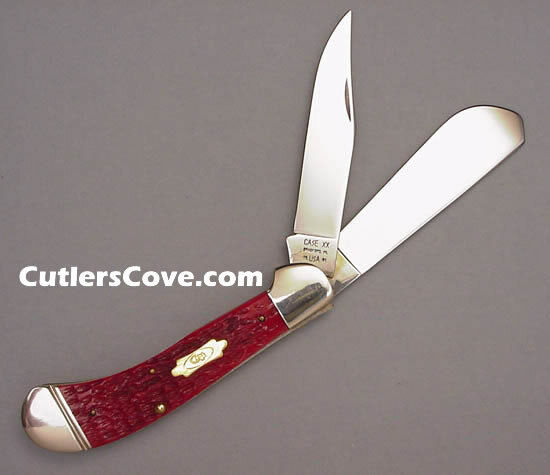 It has a clip and wide spay blade or skinning blade. Winston Cup Set - commentates the 20th Anniversary of the Winston Motor Sports. Contains 21 knives, one each representing the champion of each year for 20 years. One knife is the Winston Motor Sports 20th Anniversary knife. Limited to 1500 sets. Each knife is deep acid etched and color filled. Packed in a furniture grade cherry wood display case. The set sold for $5000.00 when it came out. I think it came out in 1991 or 1992. Dale Earnhardt won his fifth NASCAR Winston Cup Series championship in 1991.